but Easter, oh Easter was coming so fast. once again, once again, that Bunny was hired". Year after year the chicken dreams of being famous like the Easter Bunny. This year she decides that she will handle Easter alone. It's time for an Easter Chicken! Or is it? 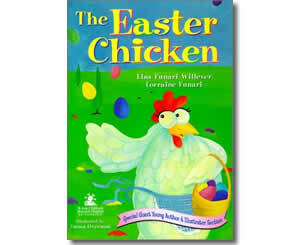 Can the chicken really replace the Easter Bunny? An entertaining story that children will enjoy!